Seth and Logan Thomas unfold their long, lanky frames from the truck, gesturing for me to follow. As we tromp around sagebrush toward willows twice as tall as me, I try to keep the brothers’ cowboy hats in sight. “This time of year, the sage grouse are on our land because that’s where the water is,” announces Seth when I catch up with them at the creek. I see what he means. All around us the sagebrush desert is dry as a bone, save the small trickle of water flowing at our feet. Logan points out the different tracks in the mud: elk, deer, birds, cattle: a veritable highway of critters. It’s late October on the eastern flanks of the Owyhee Mountains, a crux time for wildlife and livestock to seek out dwindling fresh water—and the nutritious late-season forage that grows in wet places—before winter sets in. Seth, 34, and Logan, 28, have been ranching since they were knee-high. Their father, Bob, bought ranchland in southwestern Idaho in 1996. Now, along with their father, the brothers run the Thomas Cattle Company, which they’ve since expanded. All told, the ranch stretches across 150,000 acres of private land, state leased lands, and Bureau of Land Management grazing allotments. The rangelands they manage stretch from 2,600 feet in elevation along the Snake River up to 7,000 feet in the Owyhee Mountains straddling the border of Idaho, Nevada and Oregon. Three years ago, the brothers approached the Sage Grouse Initiative, led by the USDA’s Natural Resources Conservation Service, to inquire about options for improving their agricultural operations as well as wildlife habitat. “We want to show that we’re willing to take steps to improve things. We know that we have to take care of this land, make it better, so it can support us and our kids for generations to come,” says Logan. One of the many projects cost-shared by SGI on the Thomas’ ranch is to restore mesic (wet) habitat like the creek we’re standing near. “We live in the desert, so these wet areas are pretty valuable to us. We have lots of grass, but water has always been an issue,” says Logan. The NRCS and other partners helped the brothers install six new solar-powered livestock water systems, including upland water tanks. These systems reduce trampling impacts to riparian areas by providing a water source for cattle away from sensitive stream banks. They also allow the Thomas’ to better utilize prime grasson the ranch’s uplands. “Now our cattle graze places that—without the wells—would be a waste of grass. Plus, since they don’t have to walk as far to find water, they can spend more time eating, which means bigger cows,” explains Seth. Healthy mesic habitat along streams is crucial for sage grouse in the late summer and early fall. Growing chicks and hens seek out “green groceries” to eat, like insects and wildflowers, as sagebrush uplands dry out. “We feel its very important to get the cattle off these wetlands so they don’t abuse them,” says Seth. He describes another more comprehensive project underway to restore a nearby wet meadow “where sage grouse hang out.” Along with off-site water for livestock, SGI, the Idaho Governor’s Office of Species Conservation and the USFWS Partners for Fish and Wildlife Program are cost-sharing a riparian fence, spraying weeds, and re-seeding the meadow with native vegetation. As we walk back to the truck, Ed Contreras, the SGI field conservationist who has worked closely with the Seth and Logan for the past few years, points out the remains of felled trees lying nearby. Conifers are a threat to more than ranching: sage grouse won’t nest near a tree, since they provide perches for predators like ravens or raptors. “All of the projects on this ranch are designed to reach the same goal: improve conditions for sage grouse,” explains Ed. 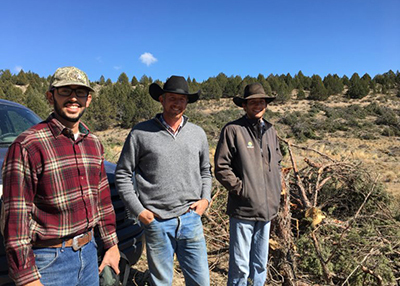 Through the NRCS, Ed helped the Thomas brothers develop an overall habitat management and grazing plan based on identified nesting and brood rearing habitat for sage grouse. The cornerstone of SGI-funded work on the Thomas’ ranch has been cutting junipers to build better habitat for the birds. All told, the brothers have cleared over 4,000 contiguous acres since 2015, creating wide-open sagebrush habitat. Removing junipers allows the Thomas’ more flexibility in how they graze livestock. Plus, they also notice it’s improved the water availability on their ranch. These projects also benefit the economy in rural communities, since ranchers typically hire local labor to implement NRCS-funded conservation practices. The Thomas’, for instance, now employ a full-time contractor just for conifer removal. Their contractor takes firewood from the cut trees to folks on the nearby Owyhee Reservation. Part of SGI’s goal in promoting wildlife conservation through sustainable ranching is to achieve landscape-scale results. Sage grouse don’t stop at fences, and require vast swaths of intact sagebrush habitat to thrive. “We want to clear conifers across this whole basin to connect the landscape for sage grouse, deer, and other wildlife,” says Ed. “That means working with public and private neighbors on juniper removal, too.” He points out an excavator in a creek bottom as we drive past. This rancher recently completed a project through SGI as well, using the same contractor who works for the Thomas’ to remove junipers. As we climb a ridge onto land managed by the Bureau of Land Management (BLM), I peer out the window into the valley. Below us, dark green trees dot the grasslands like an ominous waterfall. The line between the Thomas’ property and adjacent BLM land is starkly obvious by where conifers start and stop. Luckily, the BLM has been working hard to erase that line by developing the Bruneau-Owyhee Sage Grouse Habitat (BOSH) Project. Five years in the works, the collaborative BOSH project used GIS analysis to prioritize where to remove conifers on 1.67 million acres of public land. BLM and participating partners looked at conifer encroachment within 10 kilometers of active sage grouse leks (the distance birds keep from trees when nesting, proven by scientific research). “Ultimately the birds chose the project area,” says Lance Okeson, fields program coordinator for Boise district of BLM. Next, BLM overlaid data identifying the areas where conifer encroachment was still in the early stages (less trees per square mile). Cutting trees in these spots provide the biggest habitat benefits, since cutting densely-forested areas is expensive and less likely to return to sagebrush grasslands. All told, 726,000 acres of BLM land are being proposed for conifer treatment. The final draft of the Environmental Impact Statement for the BOSH Project is expected to come out this fall, which will then be open for a 30-day comment period. Based on public input, BLM could potentially begin removing conifers areas as early as next summer. The Thomas brothers look forward to extending the benefits of their private land restoration work to adjacent public lands where they have grazing allotments. our last stop before heading back to the ranch headquarters is another fenceline. This time, wide-open sagebrush rolls across both sides. Reflective markers dangle from the barbed wire in front of us. These small pieces of white plastic, explains Ed, keep sage grouse from striking fences by making the wires more visible. Unmarked fences can kill or injure these low-flying birds. This is most problematic near leks, since sage grouse congregate to mate before dawn and can’t see the wires in the dim light. 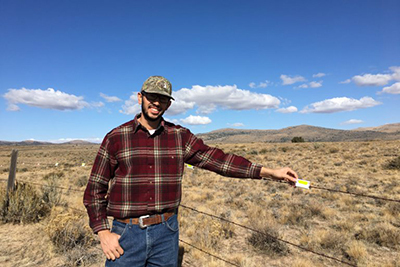 The Thomas’ marked 5,000 feet of fence around leks on their ranch with funds from SGI, making the skies safer for sage grouse. Back at headquarters, the brothers get busy with the evening chores, feeding the cows and horses in their corrals. As Logan drives a tractor full of hay, I linger a moment longer to ask Seth why they’ve put in place all of these conservation projects.